I also promised attendees that I'd be sharing the step-by-step video I recorded, as I was actually getting my system prepared from scratch for this trip. In it, you'll see how straight-forward installing VMware ESXi 6.0 Update 2 is on the Bundle 2 SYS-5028D-TN4T Supermicro SuperServer. No BIOS changes needed. I got ESXi installed by using Supermicro's iKVM Remote Console to mount the installer ISO, boot from it, then proceed with a normal install to the included USB flash drive. This particular audience was mostly developers and self-employed consultants. So when I asked the Saturday crowd of about 40 folks, "how many of you have heard of the Intel Xeon D? ", only 3 raised their hands. It turns out all 3 of those hands belonged to the proudly smiling owners of a TinkerTry'd SuperServer Bundle. Each of them was happy with their purchase. 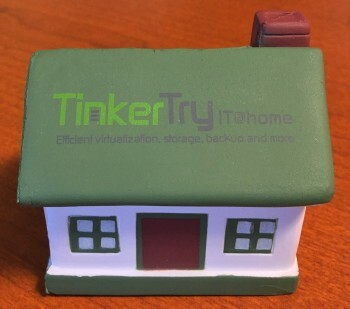 Pretty nice to meet Wiredzone customers, in person, who had found their happy home lab at TinkerTry. IT Professionals Trond Eirik Haavarstein, Jason Samuel, Carl Webster, and Paul Braren discuss their Supermicro SuperServer 5028D-TN4T ownership stories at E2EVC 2016 Las Vegas. Turns out this E2EVC audience also commonly use VMware ESXi, VMware Workstation, Hyper-V, and even Nutanix CE (Acropolis). So for their home labs, they also need LOTS of processing cores, memory, and network interfaces. I realize this post is starting to sound like an ad. What I really want to get across is that it would seem that even after 11 months since the first Xeon D-1540 product hit the market (I may have been the first customer! ), it still feels almost like the Xeon D's existence is a bit of a secret that's fun to share. I happen to enjoy doing live demonstrations, so packing that powerful 15 lb server into wheeled luggage that easily fits in the overhead compartment works out quite nicely, doing technical demos to folks eager to see the SuperServer in person, and the speeds its capable of. 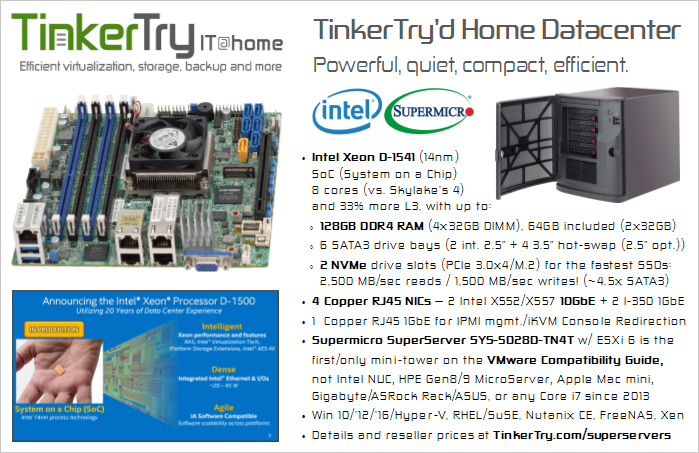 I suppose you could call these trips a bit of technical marketing, helping inform potential owners should they decide to upgrade their home labs, or at least give them a taste of what's now possible in 2016. The complete lack of vendor marketing likely prevents the Xeon D from reaching its full sales potential. For example, I've never seen an ad by Supermicro or Intel which tout the merits of this platform. No web ads either, or presence at trade shows, including VMworld 2015. Despite that lack of vendor marketing out there, the word of mouth surrounding this little gem of a processor is steadily growing. Based on the huge flurry of tweets since May of 2016, as the product line grew by leaps and bounds with the arrival of 12 and 16 core variants, I suspect the positive word-of-mouth is about to accelerate greatly. Note, if you're a do-it-yourselfer who doesn't want a turn-key solution or bundle of any sort, you can put all the pieces together yourself. Supermicro makes that far easier to do than competitors. See my build list for the 16 core Xeon D-1587, for example. You may be able to locally source those components for yourself at another reseller. 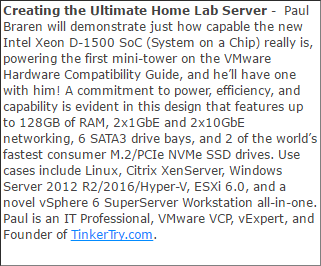 Also note that there's now the new Open Homelab Project Supermicro Xeon D-1500 page. The demonstration went pretty well, but I only covered about 60% of what I had planned to cover. Time always seems to run so short when doing live demonstration, so I managed to not get to showing how amazing it is to deploy a Windows 10 VM from a template in 18 seconds. I can say that the Q&A and instant audience polls were a blast, and hopefully folks learned some stuff. This was a fun event for me, and I really enjoyed the experience. I am so glad I went. Special thanks to tireless originator and front-man Alex Cooper, who did a terrific job pulling this event together, and keeping us laughing with his self-deprecating humor. As you can see below, we all seemed to quite enjoy his self-proclaimed "sh*tty little conference," and we sure learned a lot too, about EUC/VDI, and about each other. Hope to catch up with Jarian at another event soon!